Upper Deerfield Township in New Jersey relies on groundwater from four wells measuring 120 to 160 feet deep to supply their drinking water. The water is treated at two treatment plants with a capacity of 2.2 MGD (million-gallons-per-day) and then pumped out to the distribution system with approximately 750,000 gallons of storage. Since the deep groundwater is hard, operators add lime to the finished water to raise the pH to reduce hardness. 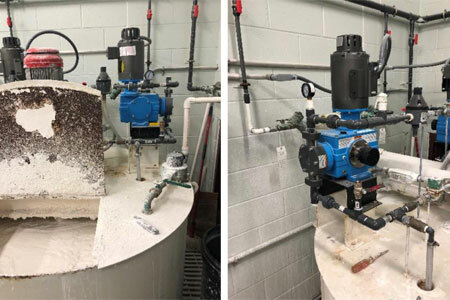 Read the full case study to learn how Encore® 700 pumps have proven themselves to be a reliable means of injecting a heavy lime slurry into a pressurized line to maintain a constant pH without constant operator attention and maintenance.